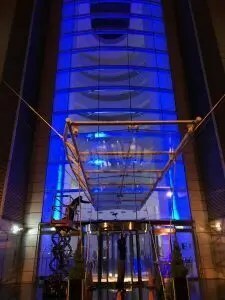 The Cardiff Window Cleaning Company were tasked to clean the glass canopy of this prestigious hotel. Presented with a 2017 Gold Award by Visit Wales, the hotel makes a bold statement on the waterfront, with its glass-fronted façade, private balconies, floor-to-ceiling windows, and iconic setting. Being one of the most prestigious 5 star hotels in Cardiff, St Davids Hotel has high standards as regards cleaning and maintenance. The impressive, unparalleled views from each bedroom are a key feature. This ensures that guests experience only the highest standards in hospitality. The glass entrance atrium is very impressive and requires regular maintenance to keep it looking its best. Being the main entrance to the hotel, just one of the challenges would be to complete the works whilst the hotel is at its quietest time. 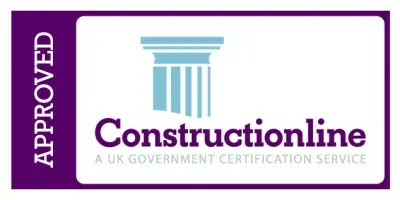 Hence the project started for The Cardiff Window Cleaning Company at midnight. This would help to ensure the least disruption to the guests. A powered scissor lift would give us the access we would need to get as close as possible to the canopy. Use a combination of water fed pole technology, along with our purified water, meant we were able to achieve a streak free finish. Both the glass and the canopy supports were left looking like new, ready for the guests. The project was a great success. 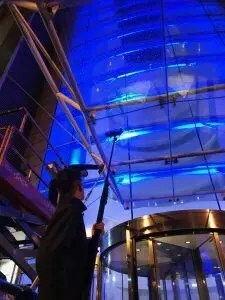 In fact, the St Davids Hotel have now appointed The Cardiff Window Cleaning Company Ltd. to look after the widow cleaning of the entire hotel. This requires the use of our own, in house Rope Access Team. Our window cleaners are now on site every week, ensuring the unparalleled views from the 5 star rooms. If you have a window cleaning project that you would like our help with, please feel free to contact The Cardiff Window Cleaning Company.